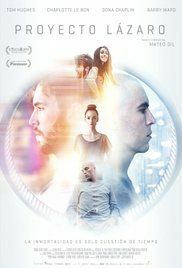 A man with a terminal illness has his body frozen and becomes the first man to be resuscitated from cryonics seventy years later in the year 2084. His on and off again girlfriend is by his side as he commits suicide in order to be cryopreserved. Being an accomplished artist with a design firm under his wing, he cannot stand the randomness of his throat cancer and decides to "go" under his own volition and control. After his "resurrection" under project "Lazarus", by a company with its own agenda, he starts to question mortality and matters of soul, as well as life as a transition of matter and energy. After realizing that he only valued his own life under the threat of his imminent death, unable to cope with his new life - feeling trapped in someone else's body - he decides to commit suicide. Alas, the film ends with the realization that that is something he's not allowed to do. Read more on Wikipedia.